to testify to the human impetus to share songs and the ubiquity of the songs joel shared on the net. If one searches for any of these songs on YouTube today, one finds numerous instances of each, sometimes numbering in the dozens or even hundreds. For the overwhelming majority of users, file sharing is purely for enjoyment and sharing with friends in an entirely non-commercial setting. Live music performances are in demand and that industry branch is flourishing and utilizing Internet technology. The traditional mass-market music CD album sales are in terminal decline due to technology progress and destructive business strategies of the past decade. Why is my brief not helpful to the Court? The Supreme Court continues to address cases where the decision turns on the intricate interpretation of a single word in a statute or regulation. But increasingly the cases that most engage the justices and that matter most to the court are about interpreting the Constitution and its allocation of power. In Citizens United, in which the court unleashed corporate, union and other money into electoral politics, the majority overturned a century of precedent that it had twice recently reaffirmed. It did so by moving past the limited controversy that was actually in the case and deciding a sweeping issue of constitutional law that no party had raised for the justices to consider. It also inserted itself where the court has said it should be most restrained, deferring to other branches with more competence to decide questions about the workings of politics, including about the role of money. 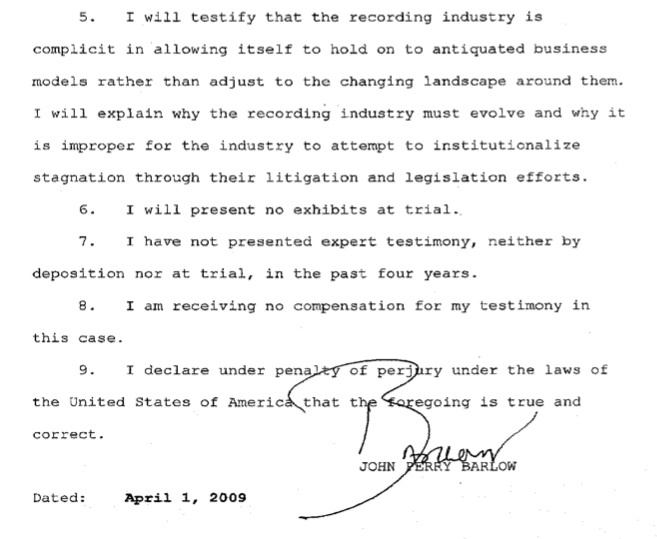 Whitney Harper, Petitioner v. Maverick Recording Company, et al. JUSTICE ALITO, dissenting from denial of certiorari. I would grant the petition to consider the question whether 17 U.S.C. § 402(d) applies when a person is found to have engaged in copyright infringement by downloading digital music files. Un-der § 504(c)(1), an infringer is ordinarily liable for statutory damages of “not less than $ 750 or more than $ 30,000” per work infringed. In a case involving an “innocent infringer,” however, the minimum statutory damages that must be awarded are reduced. Specifically, if the infringer proves that he or she “was not aware and had no reason to believe that his or her acts constituted an in-fringement,” then the minimum statutory damages per violation are $ 200. § 504(c)(2). There is a strong argument that § 402(d) does not apply in a case involving the downloading of digital music files. This provision was adopted in 1988, well before digital music files became available on the Internet. See Berne Convention Implementation Act, § 7, 102 Stat. 2857. 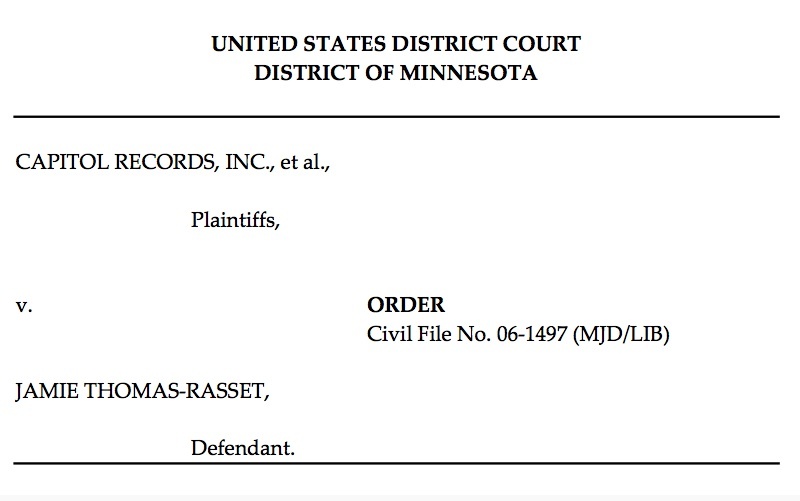 The the-ory of § 402(d) appears to be that a person who copies music from a material object bearing the prescribed copyright notice is deemed to have “reason to believe that his or her acts constituted an infringement,” § 504(c)(2). But a person who downloads a digital music file generally does not see any material object bearing a copyright notice, and accordingly there is force to the argument that § 402(d) does not apply. In such a case, the question would simply be whether the infringer “was . . . aware and had . . . reason to believe,” § 504(c)(2), that the downloading was illegal. The Court of Appeals in the present case adopted a very different interpretation of § 402(d). The court held that the innocent infringer defense was “foreclose[d] . 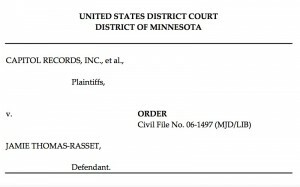 . . as a matter of law” because (1) respondents “provided proper notice on each of the published phonorecords from which the audio files were taken” before they were made available on a file-sharing network and (2) petitioner relied solely on § 504(c)(2) and did not dispute her “access” to the phonorecords under § 402(d). 598 F.3d 193, 198-199 (CA5 2010). 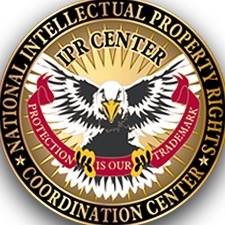 Under this interpretation, it is not necessary that the infringer actually see a material object with the copyright notice. It is enough that the infringer could have ascertained that the work was copyrighted. The Fifth Circuit did not specify what sort of inquiry a person who downloads digital music files is required to make in order to preserve the § 402(d) defense, but it may be that the court had in mind such things as research on the Internet or a visit to a local store in search of a compact disc containing the songs in question. In any event, the Court of Appeals re-jected petitioner’s argument that her youth and lack of legal sophistication were relevant considera-tions — a conclusion that would not necessarily be correct if the determinative question were simply whether petitioner had “reason to believe” that her actions were illegal. Although “reason to be-lieve” is an objective standard, it is by no means clear that certain objective characteristics of the infringer — such as age — may not be taken into account. The Fifth Circuit’s decision may or may not set out a sensible rule for the post-“phonorecord” age, but it is at least questionable whether the decision correctly interprets § 402(d). Although there are now no conflicting Circuit decisions, I would grant review in this case because not many cases presenting this issue are likely to reach the Courts of Appeals. The Court has decided not to grant review at this time, but if a conflict in the Circuits develops in the future, the question presented, in my judgment, is important enough to warrant review. Step 1: Run a virus scan on all computers you use (you should do this on a regular basis). Do this before changing your password to make sure your computer doesn’t have any malicious programs trying to steal your password. 2. Enter your Gmail username into the ‘Email address’ field. 3. Enter the verification word. 4. Select ‘Email to ****@***.com’, then click ‘Continue’. 5. Follow the instructions on the following page to finish resetting your password. Step 4: Secure your Google Account against unauthorized access by following our step-by-step instructions at http://mail.google.com/support/bin/stati…. In particular, check your Gmail settings (filters, forwarding, POP/IMAP) to make sure your mail isn’t being forwarded to an account you don’t recognize. We’re glad to have you back as a Google Accounts user again. need to be on a last minute flight that leaves in a few hours. I can furnish you with info on how you will get me the money. You can reach me via ( chrlnesson at aol.com) as am logged on via a smart device or hotel’s desk phone, the number is, +447045749898. this well-crafted message begging money was sent, judging by the rush of calls coming in to me, to every email address in my address book. Thank you for filling out the account recovery form. We know losing access to your account can be a frustrating experience and we want to help. you’re unsure about specific dates, provide your best guess. We apologize for any inconvenience and appreciate your cooperation and understanding.